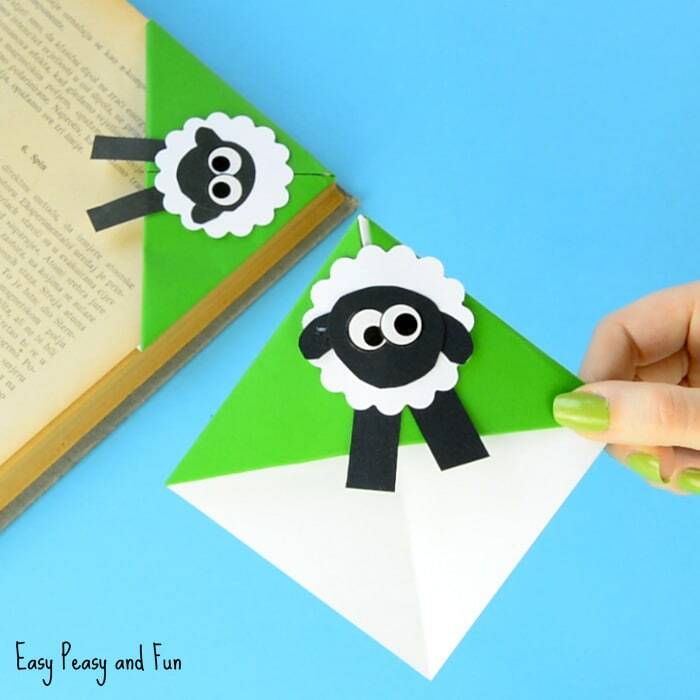 We are back with another cute corner bookmark design idea (another one perfect for spring and Easter), this time around we are making a cute little sheep corner bookmark. This one was a bit tricky to come up with, but I think this sheep craft idea turned out pretty well in the end. Are you ready? 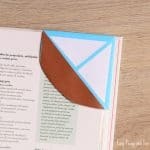 Let’s fold a DIY corner bookmark together! 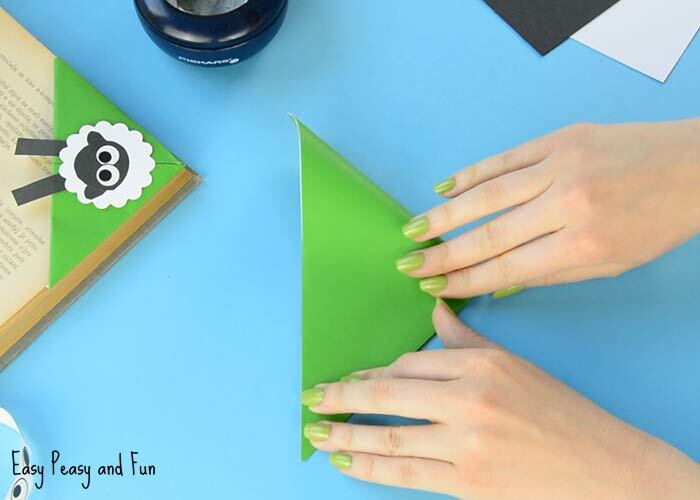 Have you or your kids ever folded a corner bookmark? 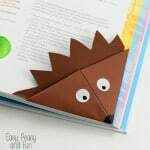 They are addictive and certainly one of the best origami for kids to start their folding adventure with. We love how easy they are to make and love the decorating diversity even more! We’ve already made a set of bunny corner bookmarks and a cute little chick, so a sheep was a must! 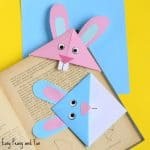 You can see our whole collection (it’s ever growing) of origami bookmarks at the end of this post. There are a ton of ideas to inspire you and your kids. This sheep craft idea was one of the most challenging, as far as designing it goes. 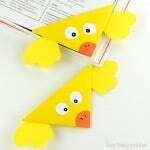 With our other designed, the natural triangle shape of the bookmark could nicely be incorporated in the end result, while the sheep design just didn’t work that way. So some thinking out of the box, well out of the triangle was needed, and I really think it worked. Not to mention it brought up a whole lot of new design ideas! So, sheep it is! 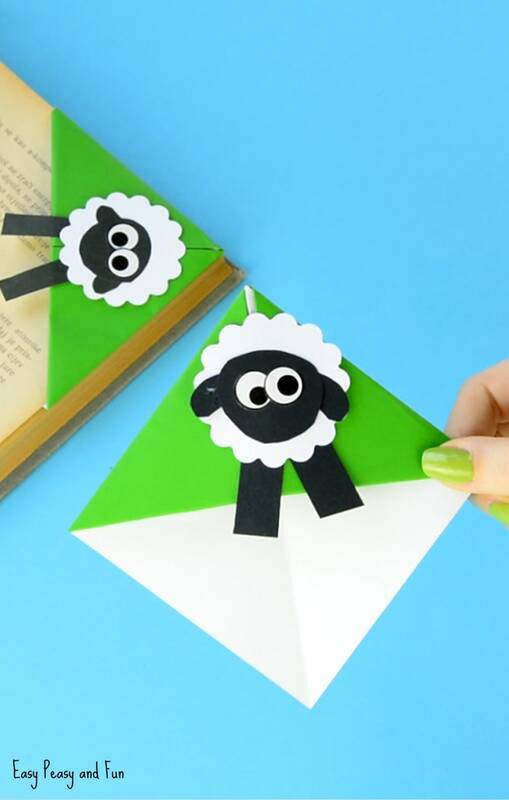 Ready to learn how to fold a corner bookmark and decorate it with a sheep? Let’s make it happen! 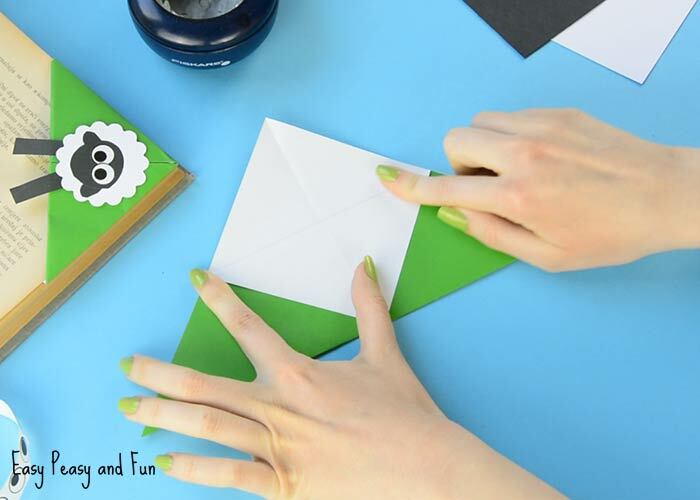 We really think punches and stickers make this project a whole lot of more fun for the kids. You can either watch the video or follow our photo instructions. 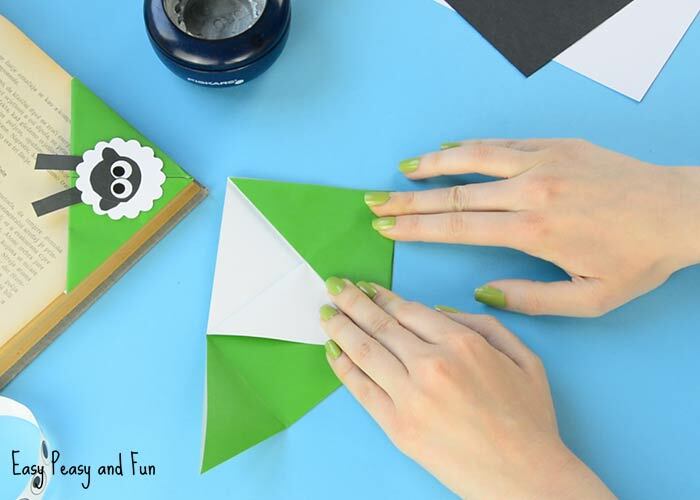 Take a green sheet of origami paper and fold it in half (diagonally). 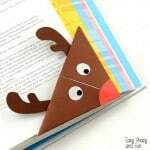 Fold in half again, only pressing at the bottom of the triangle. This marks the middle. This will make the next steps a little bit easier. Unfold to get the first triangle. 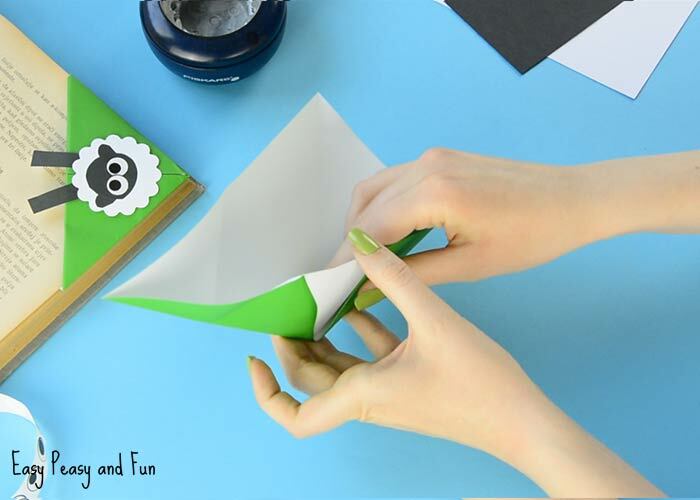 Grab hold of one layer of paper at the top of the triangle. Fold it toward the bottom. You will see a white square form. Run your fingers over the crease a few times. 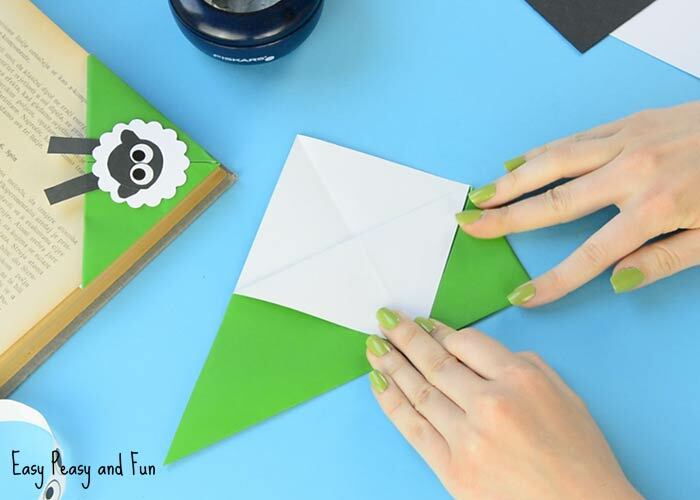 Take either the left or the right corner of the triangle and fold it towards the middle. Run your fingers on the crease. Unfold to get back to the triangle with the white square. Now take one of the corners again, this time folding it towards the top of the triangle. Now take that same corner and tuck it inside the pocket that has formed. Your sheep corner bookmark base is complete! Now on to make the sheep! Cut the round fluffy sheep body out of white paper. We used the scallop circle punch to make ours! Cut two strips of black paper for the legs and glue them onto the white body circle (on the back). Cut out a head shape out of black paper too. Also cut two ears and glue them on the head. Glue the head on the sheep body. Add the eyes too. 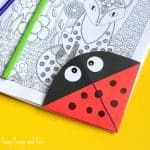 You can either cut them out of white paper and draw the dots with a black marker or you can use wiggle eye stickers like we did. 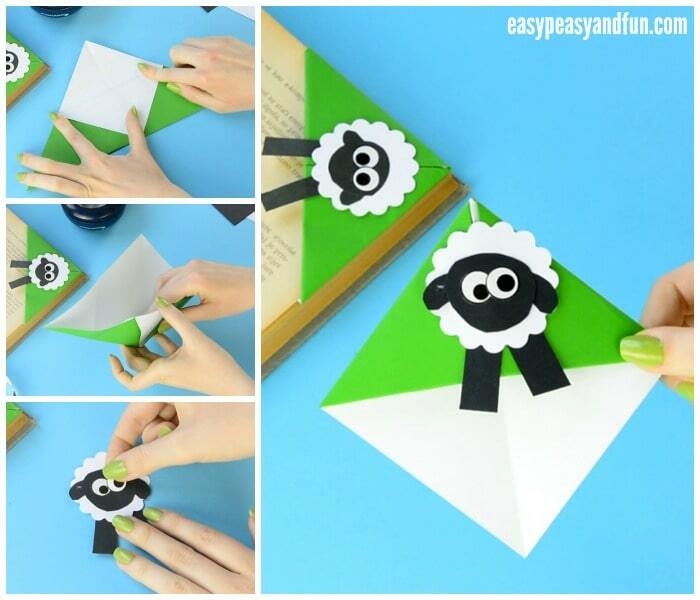 Glue the sheep on your corner bookmark base. And your sheep corner bookmark is now complete!